Come up at the start and take a small stitch as shown. Pull through till floss lays flat on the fabric. Take another stitch coming up at the edge of your last stitch. Always keep your thread either below or above the line you are stitching. Take medium size stitches along straight lines and smaller stitches on the curves. Come up through the dot, from the back side. Wrap the floss around the needle as shown. Now wrap floss around the needle again as shown. 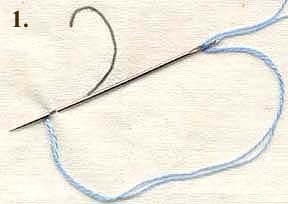 Put needle back down into the fabric close to where you came out, about two or three threads away. Pull floss tight around the needle, pushing floss up close to the fabric. Then pull needle through keeping floss tight with your thumb, until floss is pulled all the way through. Come up at the point of the petal, from the back side. Bring the needle back down close to where you started and up through the opposite end of the petal, wrapping the floss around the needle as shown. Now pull the needle all the way through and bring the needle back down on the outside edge of the petal, pulling the needle and floss through to the backside. Come up at the start of the line, weave the needle in and out along the line, stacking several stitches on the needle each time.